Eye spy… Did the Borderlands 3 trailer just secretly confirm the return of Handsome Jack's artificial intelligence? There’s a lot to take in with the full reveal trailer for Borderlands 3. Like, a lot. We’ve counted 36 of them in our Borderlands 3 trailer breakdown, to be precise. But one particular detail has captured our attention more than any other, and we reckon it’s worth pointing out separately just in case you missed it. At the 2:45 mark of the trailer, you’ll see Tales from the Borderlands’ Rhys looking at a Vault Key hologram with Zero by his side. 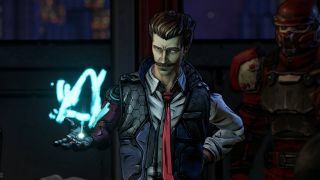 The moment seems innocuous enough at first sight, sure, but we think it may have just confirmed the return of Borderlands 2’s iconic villain Handsome Jack for Borderlands 3. First off, yes, Gearbox boss Randy Pitchford did say that Jack was for sure dead and gone during the studio's PAX stage show. But there are still some clues that indicate Jack - or at least part of him - will return. If you’ll remember the events of Tales from the Borderlands, you’ll know that Rhys accidentally uploads a copy of Handsome Jack’s AI into his ECHO eye implant, and is subsequently tortured by his holographic ghost throughout the events of Telltale’s adventure game. The AI, who is very much the Handsome Jack we know and love from Borderlands 2, spends much of its time acting as the devil on Rhys’ shoulder, trying to control him from within, and getting this close to succeeding, too. The greater good prevails, however, and Rhys eventually rips out his ECHO eye with Jack stuck in it, after which players are given the choice to either destroy the implant, or keep hold of it for future use. Now, back to the Borderlands 3 trailer, and that shot of Rhys in particular. Look closely at the hole where his implant used to be and… hang on, the ECHO is back in his head. Uh oh. Now, we could be grasping at straws here, but does this confirm that Gearbox chose the “Keep AI Jack alive” ending of Tales as the canonical timeline for Borderlands 3 and, if so, does that mean Rhys succumbed to putting Jack back in his head? That very much leaves the door open for Handsome Jack’s return in Borderlands 3, at least in digital form anyway. Even then, in a world as scientifically ludicrous as Pandora, there’s plenty of opportunity for Jack to escape his digital confines and upload his consciousness elsewhere, such as a hapless Claptrap or Torque manufactured war machine. Of course, Rhys could also just be wearing a completely new and improved ECHO implant, free of any Handsome Jack infestations, but Gearbox would be foolish to sideline one of its all time great characters for Borderlands 3, even if he’s no longer playing the main antagonist role. This theory also corroborates a previous Borderlands 3 leak (many of whose predictions have already been confirmed by the trailer), which says Handsome Jack will be returning, but in a much more limited role than that in Borderlands 2. We won’t know anything for sure, of course, until Gearbox is willing to reveal more about the game, but I’m willing to bet that Hyperion’s deposed CEO isn’t done meddling in the affairs of our vault hunters just yet. Find out more about the secret Borderlands 3 code hiding in Gearbox's teaser trailer, or watch the video below for a visual breakdown of every clue and Easter egg we found.